Since im gonna be 50 this year i bought this Little 718 S as a present for myself. I included all the "important" things like SC, PDLS, PDK, PASM and some other tech stuff. To go from an 986 S to this nearly scared med first :) I dont have the Sport Exhaust and i dont miss it at all, just go to Sport mode and its noisy enough. On the downside, i miss how smooth a 6 cylinder runs, and the cabin noise is not that good to. But it dosent ruin the drive or the feel if you ask med. Success :) But was a bit of a hassle. I had a spare membrane but the glue on that on was not as sticky as i thougt it needed to be so i ordered one more. That a good choise cause the new one was Realy sticky. The old glue i removed with a hot airgun and a knife. All the parts are Porsche parts, when i opened the box for the regulator i saw that the cable was off the green wheels. (correct name?) It was not easy to get the wire on to the wheels even if i compressed all the springs. First i tought something was wrong because it was impossible to get it over the guide that steers it on to the Wheel but with some force i managed. After a test mount i took it out again cause it made alot of terrible noise as if the Cable was off the wheels again but i looked ok. I mounted it again and moved the regulator upp and down a couple of times and the noise was gone :) Its gonna rain in a couple of days and that would be the real test to see if the membrane have a good seal. Thanks for All the help and tips and tricks!!!! Got my spares yesterday, so the plan is to fix the regulator this weekend. Wish me Luck!! Right, the Cable was snapped so im gonna order the parts amegarth mention above. I do have one question! I had to work outside and its Cold i Sweden, so the membranes glue was stiff and impossible to remove. On my new membrane the glue dosent feel very sticky, does it need heat when i mount it? Thanks for All the help!! Thanks guys! I brand new membrane but if the existing one is Ok I will be carefull with it. Aint the glas attached on 2 places? Anyway im gonna open the door this weekend, I will be back :) And thanks for the replays!! 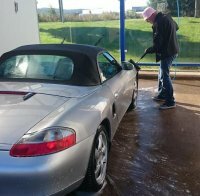 Boxster S from 2000 Yesterday i heard a bang when i was lowering tha passanger window. After that the window wont move by pressing the button but i hear the motor working, the same when i open/Close the door. The window it self can be moved by hand. The question is what to order? Is the regulator enough, or do i need the whole setup? http://www.design911.co.uk/fu/pt199_486_-cma81-cmo82/Porsche/Boxster-986-987-981/Window-Mechanism/ Is this what i need? i found this pic In this thread :) http://986forum.com/forums/performance-technical-chat/56336-whats-function-venturi-tube-tiptronic.html I dont an automatic as the guy who started the thread. But i found info regarding the brake boost. Does anybody know if this can be the cause for the misfire? Thanks RFM!! So this would realy not give me any problems as misfire and and newbie question, what does the brake booster do? The gas tank was nearly empty when i was away so to rule out condensation i filled here up after the engine started to run better.